Colour! Colour combinations transcend borders. This one came from the to-die-for garden of our first cousin (once removed) Jill. Jill lives in a to-die-for rectory in an equally death-provoking, picture-perfect village in the rolling Welsh countryside. Sheep graze across the dry-stone wall and country brook and lavender springs up at will in charmingly grouped clumps in her pea gravel terrace. 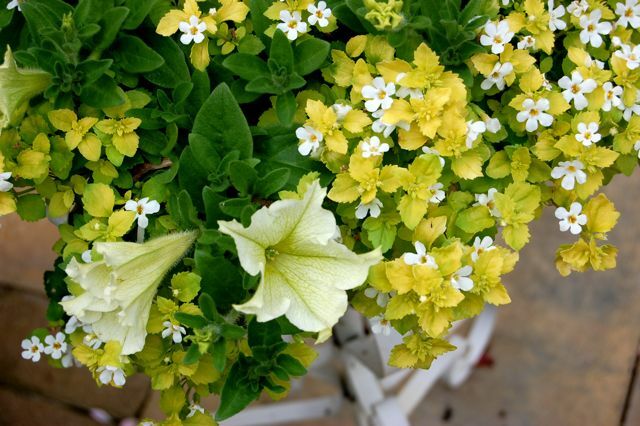 But any of us can pull off this simple, effective combination of cream Petunia and golden leaf Bacopa in a white plant stand. Monochromatic colour palettes are always sophisticated. This is one to remember. Unfortunate typography or not, the pink and purple combo is another transportable lesson in garden colour keys; it’s monochrome gone wild. 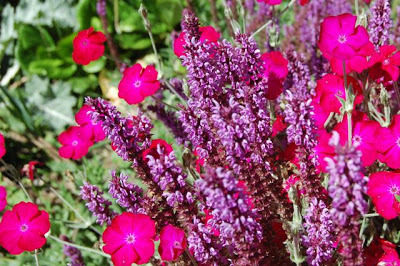 These are easy plants to grow*, even here in the T-dot: the magenta flowers of rose campion (Lychnis coronaria) with the purple spikes of ornamental sage (perhaps a variety of Salvia nemorosa). *Easy to grow, of course, if you have sun. Like most plants with a fuzzy leaf, these two require sunshine to perform at their best. When happy, however, they’ll knock themselves out with flowers. And what a striking picture they make, in harmonious colour and contrasting form, flowering together. So, never say never, gang. 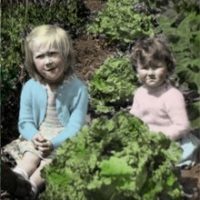 There are plenty of things we can do, English garden-style.